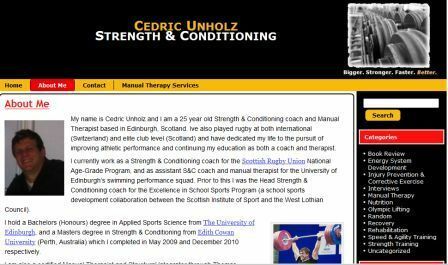 Recently, I was contacted by an 8weeksout member from Scotland named Cedric Unholz from Scotland asking if I’d be willing to do an interview for his website. I get a pretty good amount of such requests and usually I have a hard time finding the time for them, but after taking a look at Cedric’s site and seeing his strong educational background as well as his practical experience as a strength coach, I agreed to do the interview. I figured it would be easier to do an audio interview and due to the time difference between Seattle and Edinburgh, Scotland, we literally did the interview at midnight. Cedric asked me some great questions on a variety of topics ranging from my thoughts on FMS to books I recommend to HRV and how I use the Omegawave and just about everything in between. I can’t hear any of the audio when Joel is speaking only when Cedric speaks. I’ve tried in Firefox and IE. Is it just my pc? I had the same in the Buddy Morris interview where I could hear Buddy but not Joel. I would venture it has something to do with your sound card or configuration or speakers. It’s recorded in two channels, for some reason you are not hearing one of the channels, not sure why but I haven’t had others complain of the same issue. It works fine for me. Great interview Joel. Cedric’s site is great, he’s definitely one to watch. How do you spell the author’s name that you mention at 1:01:15 who wrote about energy systems training? Thanks.